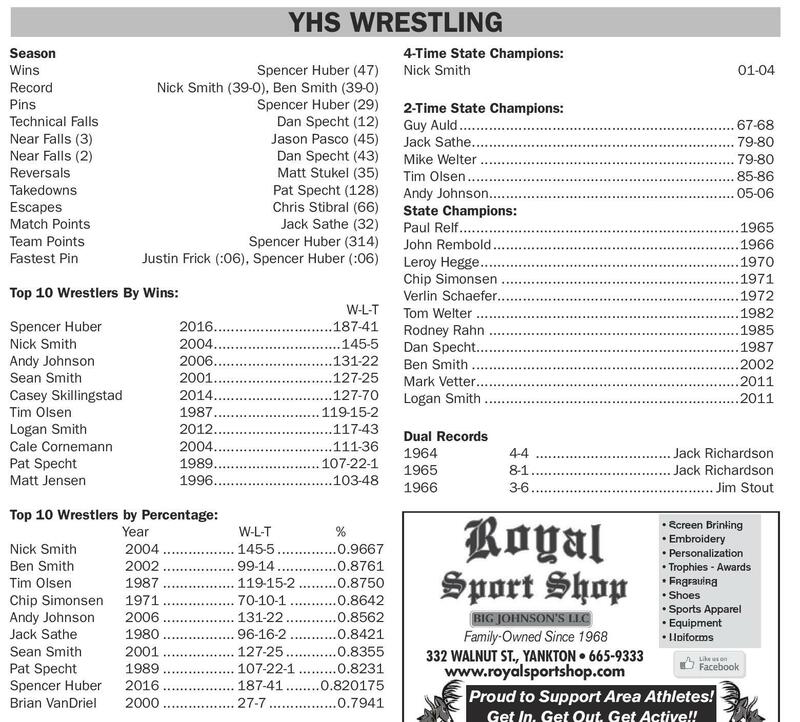 WRESTLING DATE	OPPONENT	TIME 11/30	Beresford/Watertown............... 5:00 PM 12/2	Watertown...............................10:00 AM 12/5	Lennox/SFL/SFW (Lennox)........ 5:00 PM 12/7	Verm/BV/DV (Vermillion)........... 5:00 PM 12/16	SF Washington.......................... 9:00 AM 1/6	Brandon Valley.......................... 9:00 AM 1/8	Brookings/SF Roosevelt (Brook).5:00 PM 1/12	Aberdeen Central/Brandon Valley..1:00 PM 1/13	Harrisburg Invite........................ 10:00 AM DATE	OPPONENT	TIME 1/18	Huron....................................... 6:00 PM 1/19	Pierre....................................... 7:00 PM 1/27	Brookings Invite........................ 9:00 AM 1/30	Mitchell/Harrisburg.................. 5:00 PM 2/3	Yankton Invite.......................... 9:00 AM 2/10	Huron Invite.............................. 10:00 AM 2/16	Regional (Sioux Falls Pentagon).. 1:00 PM 2/23	State (SF Premier Center).......... 10:00 AM 2/24	State (SF Premier Center).......... 10:00 AM YHS WRESTLING Season Wins	Record	Pins	Technical Falls	Near Falls (3)	Near Falls (2)	Reversals	Takedowns	Escapes	Match Points	Team Points	Fastest Pin	Spencer Huber (47)	Nick Smith (39-0), Ben Smith (39-0) Spencer Huber (29) Dan Specht (12)	Jason Pasco (45)	Dan Specht (43)	Matt Stukel (35)	Pat Specht (128)	Chris Stibral (66)	Jack Sathe (32) Spencer Huber (314)	Justin Frick (:06), Spencer Huber (:06) Top 10 Wrestlers By Wins: W-L-T Spencer Huber	2016.............................187-41 Nick Smith	2004...............................145-5 Andy Johnson	2006.............................131-22 Sean Smith	2001.............................127-25 Casey Skillingstad	2014.............................127-70 Tim Olsen	1987.......................... 119-15-2 Logan Smith	2012.............................117-43 Cale Cornemann	2004.............................111-36 Pat Specht	1989.......................... 107-22-1 Matt Jensen	1996.............................103-48 4-Time State Champions: Nick Smith	01-04 2-Time State Champions: Guy Auld.................................................................. 67-68 Jack Sathe............................................................... 79-80 Mike Welter............................................................. 79-80 Tim Olsen................................................................ 85-86 Andy Johnson........................................................... 05-06 State Champions: Paul Relf...................................................................1965 John Rembold...........................................................1966 Leroy Hegge..............................................................1970 Chip Simonsen.........................................................1971 Verlin Schaefer..........................................................1972 Tom Welter...............................................................1982 Rodney Rahn............................................................1985 Dan Specht...............................................................1987 Ben Smith................................................................2002 Mark Vetter...............................................................2011 Logan?Smith.............................................................2011 Dual Records 1964	4-4 ................................. Jack Richardson 1965	8-1.................................. Jack Richardson 1966	3-6............................................ Jim Stout Top 10 Wrestlers by Percentage: Year	W-L-T	% Nick Smith	2004.................. 145-5...............0.9667 Ben Smith	2002.................. 99-14...............0.8761 Tim Olsen	1987.................. 119-15-2..........0.8750 Chip Simonsen	1971.................. 70-10-1............0.8642 Andy Johnson	2006.................. 131-22.............0.8562 Jack Sathe	1980.................. 96-16-2............0.8421 Sean Smith	2001.................. 127-25.............0.8355 Pat Specht	1989.................. 107-22-1..........0.8231 Spencer Huber	2016.................. 187-41.........0.820175 Brian VanDriel	2000.................. 27-7.................0.7941 - 25 - • Screen Printing • Screen Printing • Screen Printing • Embroidery • Embroidery • Embroidery • Personalization • Personalization • Personalization • Trophies - Awards • Trophies - Awards • Engraving • Trophies - Awards • Engraving • Shoes • Engraving • Sports • Shoes Apparel Family-Owned Since 1968 • Shoes • Equipment • Sports Apparel 332 WALNUTSince 1968 • 665-9333 Sports Apparel ST., YANKTON Family-Owned Since 1968 • • Uniforms Family-Owned www.royalsportshop.com • Equipment 332 WALNUT ST., YANKTON • • 665-9333 • Equipment 332 WALNUT ST., YANKTON 665-9333 • Uniforms Proud to Support www.royalsportshop.com AreaUniforms • Athletes! 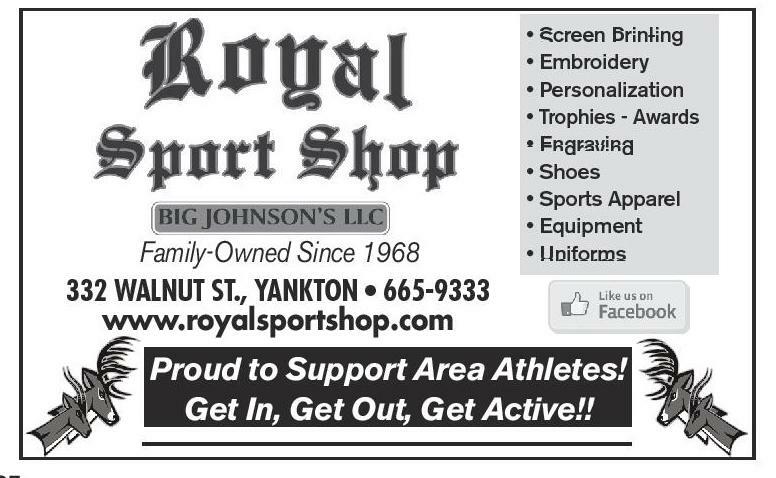 www.royalsportshop.com Get In, Get Out, Get Active!! Proud to Support Area Athletes! Proud to Support Area Athletes! Get In, Get Out, Get Active!! Get In, Get Out, Get Active! !